Evil Von Purple Cape and the Masters of Anatomy! 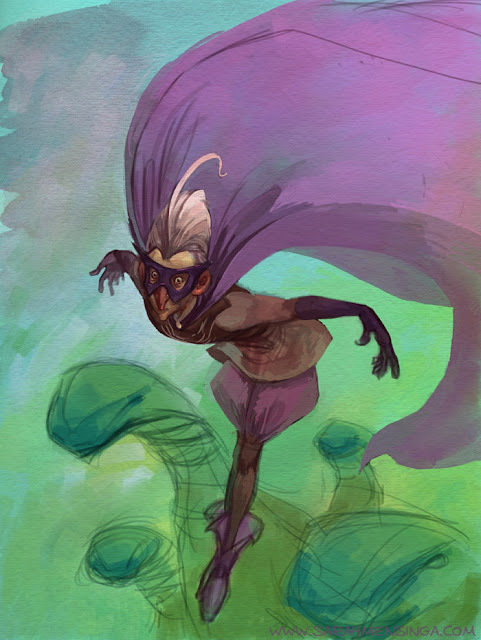 I like posting with artwork, so here's an unfinished painting of a supervillain. But really I'm posting because I'm super excited to announce that I'll be contributing to a Kickstarter for an art book called the Masters of Anatomy. Evil Von Purple Cape, I love. I am so impressed, congratulations! !I will definitely be buying that book as soon as possible, I'm so excited. I came across your graphic novel by accident yesterday and I am loving it. I can't believe more people have not discovered it (meaning why haven't I heard of this before?!!). This should be published! I understand the reasons you haven't, but this should see print. Have you ever considered taking it to Image or Dark Horse comics? I'm loving it so much that if your pursued a Kickstarter campaign for it, it would be the first one I'd give money to. Just had to share. Thanks for your work. Thanks for your response. I totally get your reasons Putting other things on hold to raise your children is wonderful and the right thing to do. I'm glad you have hopes of returning to this someday. I know I'll be watching for it (I also think it could be more than a comic and taken into other storytelling media). Thanks again for your work. Your work is amazing. I've been looking at it for ages now because I find it so inspiring.